The outlook for Jackson is not too good. The vet explained to me that he thinks an operation will be necessary as they could see his hernia clearly when they put the camera down his throat. The hernia is pushing open the trap door that normally stops acid coming out of the stomach and into the throat. Jackson’s trap door is open and so the acid rises and burns his throat. He said that Jackson’s throat was raw and bleeding. They ballooned him again in the hope that the balloon might push the hernia back but I did not feel they were very hopeful. I have pills and anti acid medicine to give him. If he regurgitates again, I am to telephone immediately, even if it is only a small amount. They also said that another Bengal they had treated for the same condition had several of his pedigree in common with Jackson. He is so pleased to be home – running and playing and now fast asleep in his hammock. I need to wake him to give him the medicine – not an easy task. I will write more tomorrow – feeling a bit stressed right now! Jackson is home!! I will write more later when I have finished the packing…………………. No word from the hospital yet – it is 3.15pm here. I do not really expect a call until after 6 pm. It is very cold here and snow is forecast – I hate snow! Jackson has never seen any – I wonder what he will make of it! John and Kevin are both outside putting their winter tyres on their Land Rovers. I rescued my sock from Jackson’s attack on it and, apart from a few loose stitches, it is OK. 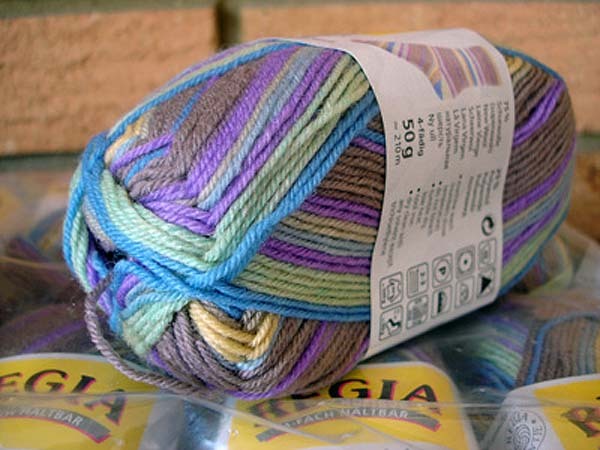 I have some Opal Hundertwasser Sparkle sock yarn coming and also some Opal Surprise. 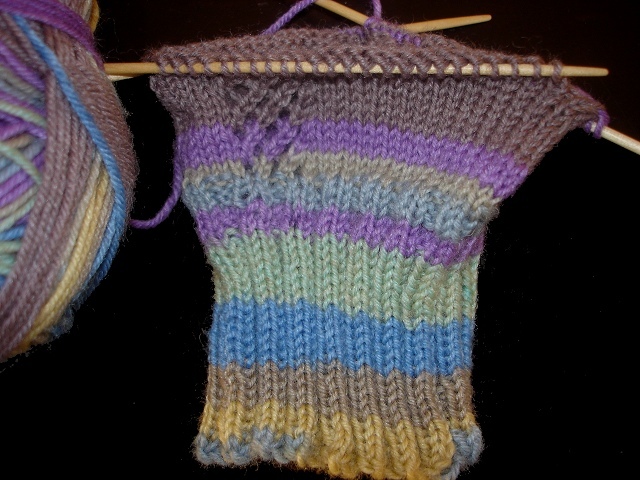 I much prefer the Opal sock yarns to the Noro ones. They are much softer and have more give in them. Now I am going to iron and then cook spaghetti with garlic bread for dinner. I will write more when I have heard from the hospital. Jessica telephoned at 8.30 pm. Jackson flatly refused to eat the biscuits with the radio active material in and so they could not carry out the test! Tomorrow they are going to put a camera down his throat and have a look and balloon him. She said he was very grumpy and growling but that she understood that he is afraid and stressed and she was going to sit with him for an hour and try to win him round. Also Karla ( the student who looked after him last time) is going to visit him..
And so I feel they are kind and thoughtful. He should be home on Friday. I was not best pleased when I picked up my knitting tonight. Jackson had attacked it and I had to undo a lot. I hate undoing lace……I am never sure whether it is a stitch or a yarn over. It is OK now and looking good. I will take a photo tomorrow. Now I am going to sit down. I feel worn out! It is 1.00 pm and we are home minus Jackson. We saw a different student today – Jessica. She asked lots of questions about Jackson’s regurgitating and then went to examine him. He was having none of it – hissing and growling. After a lot of petting, he eventually allowed himself to be removed from his basket. Jessica felt his throat and said she could feel a stricture. She explained to me the danger of wet food and strictures. The wet food builds up in the narrow part of the throat and eventually there is no room for more food to go down and so when the cat eats there is a danger that the food would go down his windpipe and into the lungs and cause pneumonia, But the dry biscuits are so small that they can slip past the stricture and won’t build up. Then Joel, the qualified vet, came and said that they would feed Jackson some food with a dye in it and put him in a glass box and a machine ( I can’t remember the name ) would track the progress of the food down his throat and they can watch on a screen. That will be done today and then tomorrow they are going to balloon his throat again. He said it may have to be done as many as five times. Since it costs $1,100 a time, I am thinking I shall have to go on the streets!! They will call me later today and tell me what they saw on the screen. Now I must get on – way behind. I will write again tonight when I have more news. Sorry I did not write over the weekend. I had an upset tummy and felt like death! I do not know what caused it as John and I had eaten the same things and he was fine. It is better now which is just as well as we take Jackson to the vet again tomorrow. He telephoned me on Friday to see how Jackson was and I told him he had started to regurgitate more frequently and also that he is tossing his mouth. He said he was not surprised as the ballooning usually needs to be done 3 or 4 times. I am now starting to worry about the cost of all this as my insurance cover is only for £4,800 and so multiple balloonings may exceed this. I have to leave him there tomorrow for at least two nights – I hate taking him and walking out without him. I like the pale colors! I am expecting some Calmer and Extra Fine Merino from Rowan and the Rowan rep is coming next week to show all!! I will report back when we have deposited Jackson tomorrow. One of my customers sent me this link today – do watch, it is really good! You may need to refresh the page one or two times to get it to play – persevere!! Nothing much has happened here – Jackson is now regurgitating every day and so I shall be pleased to take him on Tuesday and get more treatment for him. He has lost a little weight since I started restricting him to dry food but that is not a bad thing as he was getting quite portly around the waist area. He is lively enough and his coat looks good – if only we could stop this regurgitating. Now I must go and weigh my parcels ready for the postman, it is foggy here and very damp!